At a stone's throw from Artois Expo, 5 minutes from the Grand Place d'Arras (Baroque architecture) and the Bellfry (listed as a UNESCO world heritage site), 10 minutes from the National Necropolis of Notre-Dame-de-Lorette, 15 minutes from the Louvre-Lens Museum, and at the crossroads of 2 major capitals (London, Paris and Brussels), come discover our new Hotel Première Classe Arras – Saint-Laurent-Blangy. Our establishment is served by two major highways, A1-A2 (Paris-Roissy-Lille-Bruxelles) and A26 London-Calais-Reims-Dijon). It is at the heart of the Northern European LGV train traffic. An idea location from which to explore the Artois region, Hotel Première Classe Arras – Saint-Laurent-Blangy welcomes you to its 72 modern rooms with all the amenities. Among our rooms, 10 are designed to accommodate up to 4 people. We also have connecting rooms for families with children. Three of our rooms are specially adapted for people with reduced mobility. 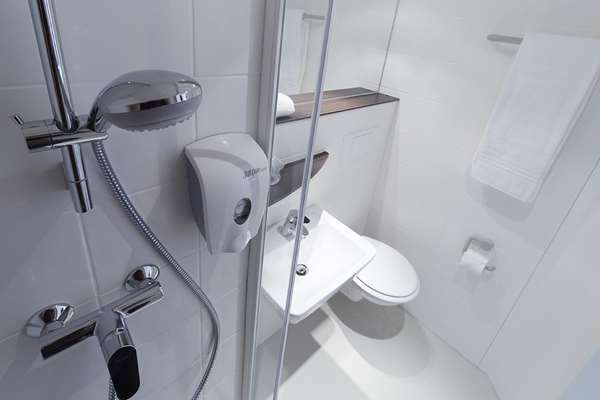 Your air-conditioned room has a private bathroom with toilet (towels and shower gel provided). You can access the Internet with our free unlimited Wi-Fi connection. For pleasant evenings, the hotel provides an individual TV with TNT and Canal+ channels. After a good night's sleep, a wonderful breakfast awaits. It is served from 6:30 am. Hotel Première Classe Arras – Saint-Laurent-Blangy offers free parking. We welcome you from 6:30 am to 11:00 am and 5:00 pm to 9:00 pm (from 7:00 am on weekends). If you get hungry, we have vending machines with candies, cookies and hot or cold drinks available 24 hours a day. You will also find a selection of newspapers for your reading pleasure. Our establishment offers 72 modern, spacious rooms designed to provide comfort and functionality. All our rooms feature high quality bedding with a duvet, a flat-screen HD TV, air conditioning and free Wi-Fi access. You will have a private bathroom with toilet, shower and sink. Bath towels and shower gel are provided. To start your day off right, come enjoy our all-you-can-eat breakfast buffet with a balanced variety of brand name products: 100% pure Tropicana orange juice, espresso, buns, fresh baguettes, Breton Bar and hot drinks. Everything you need for a good breakfast, offered at just €5.90 per person. Breakfast is half price for your children under 10. Hello, thank you for your message of satisfaction. We're glad that you appreciate your stay in our etablishment. Hoping to welcome again. Very cordially. We generally stay in 4-5 Star hotels, but this trip was functional. We came to Arras to buy lots of wine and spend one night somewhere cheap and cheerful and this hotel hit the spot. It’s clean and has secured access for guests; so safe. Easy to find. Room was clean. Basic. We were so tired that we slept like logs. Bring your own hairdryer as mom supplied and toiletries. The soap provided is drying. Hello, thank you for your good comment. We appreciate your feedback. We notice for soap provided. Very cordially. Handily located on the edge of the centre of Arras (10 minute walk to the town centre, 10 mins drive off the A26), this budget hotel is clean, has good sized en-suite rooms with comfortable beds. The staff have always been very nice and helpful and we like the secure car park - it’s locked overnight. We use this as a stopover returning to England from our house in eastern France near Switzerland and have a family room: either a double, single + bunk over the double bed or twin with single + bunk. This is ideal for a meal out and off to sleep then up early to head to Calais to arrive in England ahead of the heavy traffic on the south east motorway network. There are some nice bars and restaurants in the centre of Arras. We have a quick drink in one of the historic squares and usually go to our favourite place to eat the vegetarian restaurant Mezzaluna - book ahead if you want to try it! Great low cost hotel and much better than the average Premiere Class (PC). You can walk to Arras Grand Place in around 15 minutes and its really lovely, worth a trip. Hotel isn't in a great location and gets loaded with vans at night but its obviously had a decent upgrade and is clean inside, in typical PC style. Reception is great although local taxis are not very helpful or convenient. Say ten minutes and give up after wasting an hour! This hotel is good though, worth a visit if in the area. Hello, thank you for your feedback. We appreciate your comment. We apologize problem with taxi, he arrived 30 minutes after you left hotel. I told him is not professional. Hoping to welcome again. Cordially. It's All True! Outstanding Value! We booked this hotel based on posted reviews and just about everything we read listed under 4 and 5 Stars proved to be true: the price is a steal, the rooms are small but space efficient, the hotel is almost new and therefore very clean, shower good, the basic amenities are adequate for a short stay, the parking is free and secure with easy access to the highways. On the negative side, the Wifi is hit and miss, sound proofing is not great, the continental breakfast is only coffee, juice, bread and yogurt and there is nothing close by within easy walking. However, if you have a car, there is free parking everywhere downtown after 6pm but be fore warned that it seems everyone dines out on Saturday night and restaurant reservations are a must. I believe this place gets consistent high reviews solely because of value for money. It is downright cheap compared to other accommodations in the area. Although we had no problem, I think sound proofing could be an issue depending on the activities of fellow guests. We could plainly hear normal conversations outside our room. Hello Bob, thank you for your detailed message. We appreciate your compliments. For wi-fi, we are doing necessary to obtain a better connecting, we understanding your comment. We're hoping to welcome again. Best regards.